CCSI offers on-site break/fix technical services and can also provide a more proactive Managed IT Services plan tailored to meet your business needs. 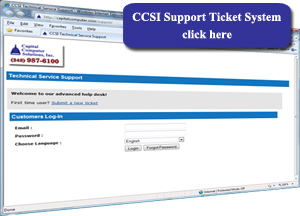 CCSI technicians have over 20 years of industry experience and maintain standard computer repair authorizations. We have qualified engineers that are able to monitor, troubleshoot and repair your server, desktop, laptop, related hardware and network. Use the link above to submit a new Service Request or login if you already have an account. There is NO fee to submit a support ticket. Service Requests typically receive a response within 30 minutes and we can schedule an on-site visit the same day! Do you need help right away? Download our Remote Support Tool to have us solve your computer problem over the Internet. We take control of your computer over a secure connection. No installation is required, just run the program! And you don’t have to worry, once your remote session is over, just close the program. We cannot control your computer without YOUR permission! Please call our Remote Support Hotline after downloading the tool. We will determine within the first few minutes if your issue can be resolved remotely. You don’t pay anything until you authorize us to perform the repair. On-site break/fix support is available in the following Michigan areas: Oakland, Wayne, Washtenaw, Livingston, Macomb, Farmington Hills, Livonia, Novi, Farmington, Northville, South Lyon, Canton, Plymouth, Ann Arbor, Ypsilanti, Royal Oak, Berkley, Ferndale, Birmingham, Bloomfield, West Bloomfield, Walled Lake, Commerce, Southfield, Beverly Hills, Redford, Detroit, Waterford, Rochester, Auburn Hills, Pontiac, Troy, Mt. Clemens, Madison Heights, Hazel Park, Sterling Heights, Milford, Wixom, Warren, St. Clair Shores, Hamtramck, Harper Woods, Grosse Pointe, Dearborn, Westland, Melvindale, Eastpointe, Roseville, Lincoln Park, Romulus, Taylor, Wyandotte, Trenton, Flat Rock, Flint and most areas within southeast Michigan. (Trip charge included for visits outside a 30 mile radius of zip code 48334). © 2019 Capital Computer Solutions, Inc. All rights reserved.